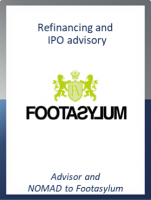 GCA Altium acted as financial advisor and NOMAD on the IPO of Footasylum plc, the fast growing UK-based fashion retailer focusing on the branded footwear and apparel markets. The IPO valued the business at £171 million raising £65 million for the company and existing shareholders, with the first day of dealings taking place on 2nd November 2017. The IPO will provide the business with the funding and platform to continue its expansion and investment in its new store openings and online retail activities. Footasylum, which was founded in 2005, retails "on-trend" product ranges which are predominantly aimed at 16 to 24 year old fashion-conscious customers and are sourced from an extensive stable of third party and own brands. These include well-known sports and casual footwear and apparel brands (for example Adidas, Nike and Under Armour), as well as up-and-coming brands and own label products such as Kings Will Dream and Glorious Gangsta. Footasylum operates a multi-channel model which combines a 60-strong store estate with a fast-growing eCommerce platform and a recently launched wholesale arm for distributing its own brand ranges via a network of partners. eCommerce represented approximately 30% of this year’s revenues. The business has assembled an impressive management team and board to execute its continued strategy of investment in the expansion of its existing routes to market, technology systems and marketing programmes in order to support its future growth and optimise its engagement with its customers. Clare Nesbitt, Chief Executive Officer of Footasylum, said: "We are delighted that our product-led, multi-channel expansion strategy has resonated so strongly with investors, and are thrilled to have received such a strong level of demand for the IPO. We are very pleased with the outcome and it was a pleasure to work with the GCA Altium team throughout. They showed strength in depth across their corporate finance, debt advisory and capital markets teams and have real expertise to bring to bear in the Consumer sector. They ran an efficient process providing clear advice throughout, which enabled us to select an IPO as the best route to achieve a fantastic springboard for future growth." Phil Adams, CEO at GCA Altium, said: "It has been a fantastic experience working with such a driven management team and group of founding shareholders. Footasylum has shown remarkable growth and has a great platform to continue this both online and in physical stores. We worked closely with the board and family shareholders to review a number of options for funding the next phase of development and believe that IPO represents the best platform for the company to flourish." Sam Fuller, Managing Director at GCA Altium, said: "Footasylum is a cracking business, combining traditional bricks and mortar retail expertise, a fast growing online presence and a young, dynamic management team and we look forward to working with them post IPO. This deal represents GCA Altium’s 13th UK consumer transaction in the last 12 months, reinforcing our reputation as one of the leading mid-market consumer sector M&A advisors."